I spotted a wonderful book about retro caravans and have been a little obsessed with caravans ever since. Perhaps I should take off my vintage rose-coloured cat eye glasses – my real experience with caravan holidays is less about polka dotted curtains and cosy booth tables and more about beds that are too small and queuing for a shower at the caravan park toilet block. 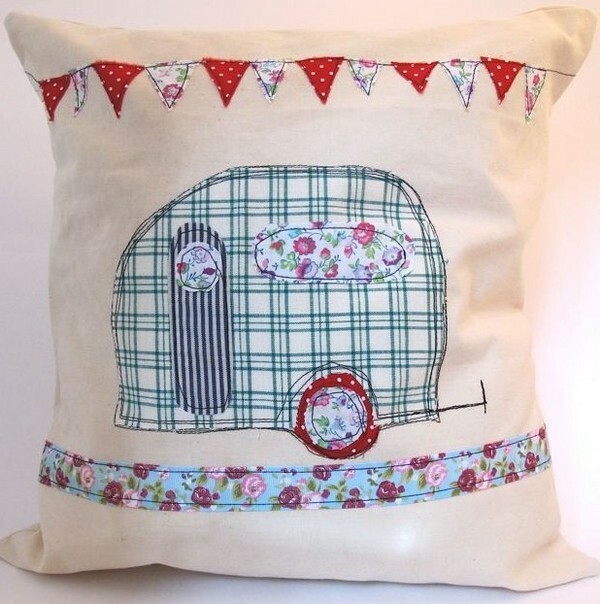 That said, I think it’s best that I focus all my retro caravan love on the huge range of goodies that are cropping up using caravans as a design feature. 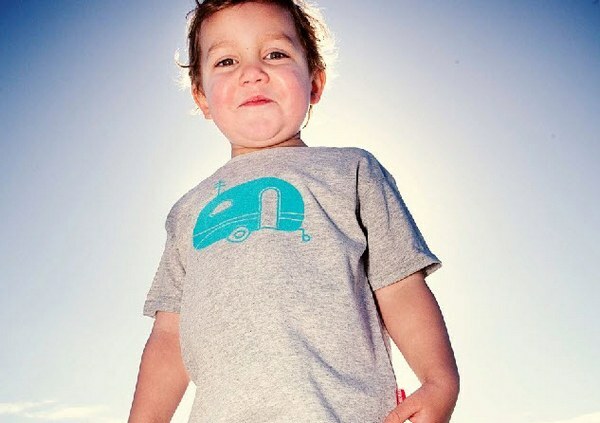 Start out by wearing your retro caravan with Monstar’s super t-shirt ($32 from Mia & Ollie). 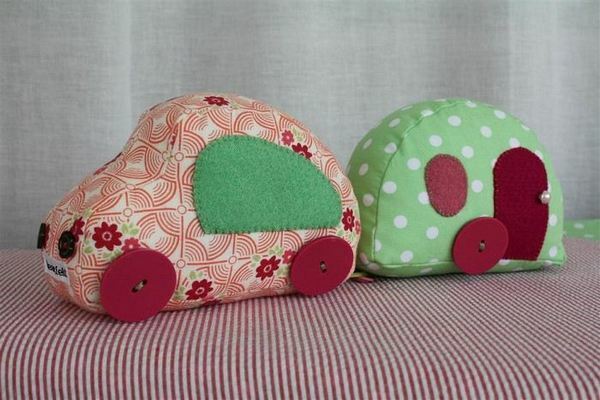 For baby campers, The Happy Nest’s soft car and caravan set is so sweet – various retro fabrics are available and each set is $35. 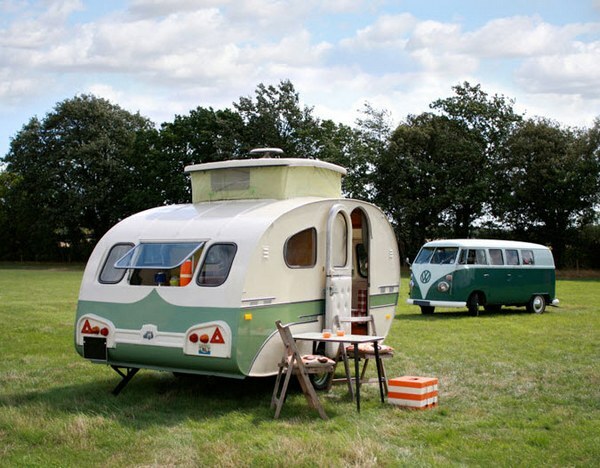 For an instant retro look, caravans make a fab decorating statement. 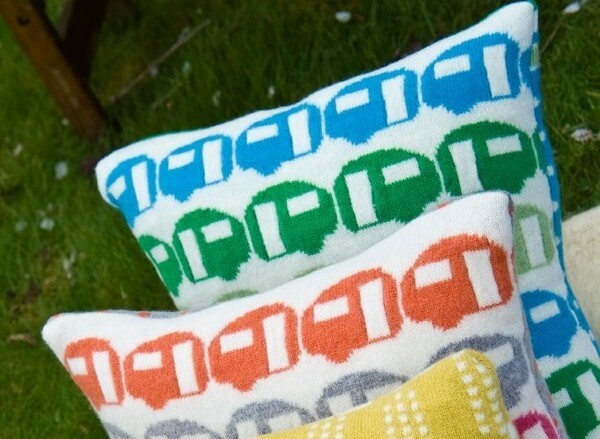 It was caravan-love-at-first-sight when I spotted the stunning knitted woollen Happy Days cushions from Etsy’s Elsy & Vine (US$70) and Bespoke Bunting’s cute appliqué Le Camping cushion (US$33). 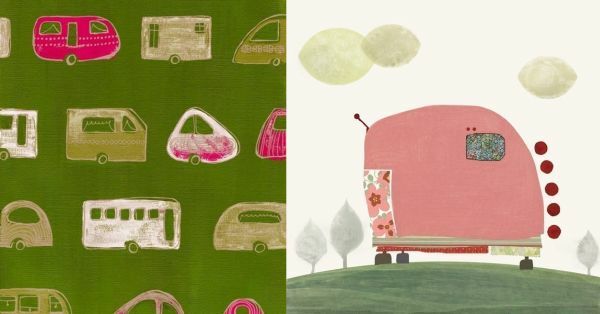 There are some superb caravan print fabrics available if you want to create something from scratch – the muted tones of From Laura With Love’s Retro Caravans with Map Detail fabric is gorgeous and available from Babyology favourite, Spoonflower. For something brighter, Leanne Graeff’s orange Camp series (fabric, baby t-shirts, tea towels and totes) is fun for a nursery (or kitchen or living room!). Nursery walls don’t miss out. It seems caravans are covered in all mediums from photography to lino cuts – I’ve picked out a couple to give you an idea of the different styles available. 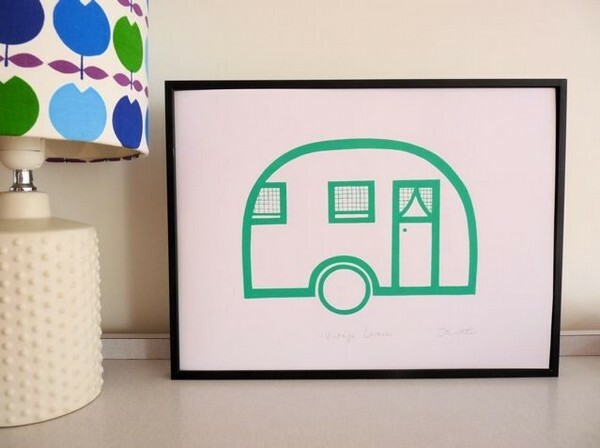 The Vintage Caravan screenprint by Jane Foster is a simple and bright choice – it’s US$24 and available from Foster’s Etsy store. Also nursery-worthy is Aliette’s Pink Caravan print (US$24) and Sea Spray Blue’s dramatic Caravan Exhibition (US$19) – both are available at Etsy. It was when I bought my third caravan brooch that I told myself it was time to show restraint – needless to say all my coats will be sporting retro vans on the lapels this winter. Check out the gorgeous wooden campers from Etsy’s I Wish I Had a Little Shop or a bright acrylic version from Tree Party Design. If you want caravan jewellery but there’s no parking space left on your coat lapels, find funky Scout camper rings (US$12.95) at Etsy’s Dolls & Molls or Lucky Scout necklaces (US$24) at Etsy neighbour Neogranny. Probably by now you want your own retro caravan (a real one). 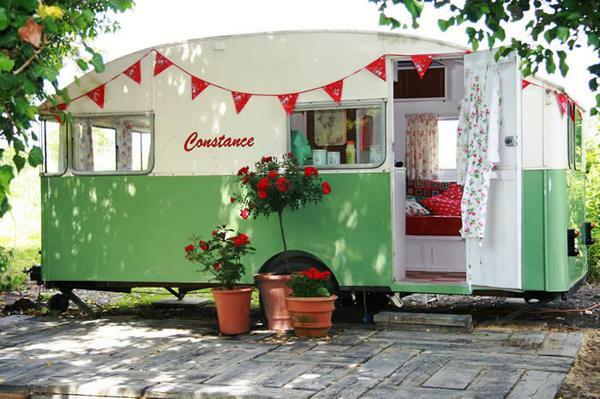 If you have a van just waiting for a vintage-styled overhaul, look no further than Chris Haddon and Jane Field’s blog, My Cool Caravan for styling advice. 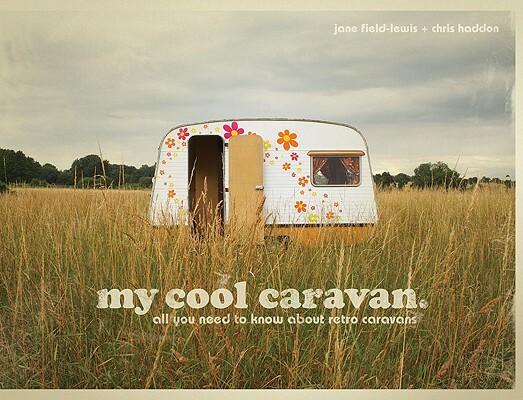 Haddon and Field are unquestionably the retro van gurus and have put all of their caravan know-how into a book, My Cool Caravan (available at Book Depository for $24.02). 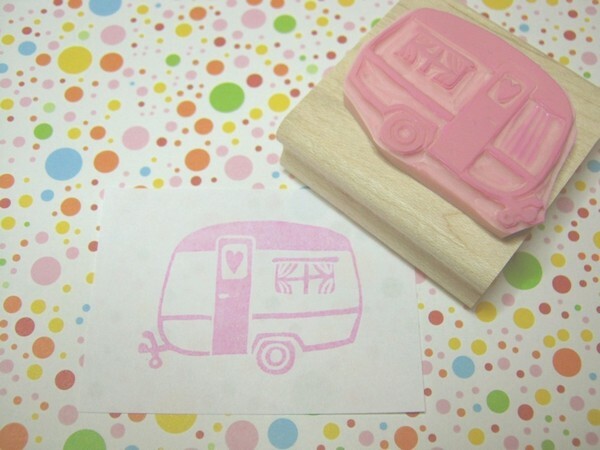 For a little bit of caravan craft fun, show everyone you’re a happy camper with a caravan stamp of approval by Skull & Cross Buns – the hand-carved rubber stamp is £8.75. I’ve saved my least expensive and most expensive caravan finds for last. For your free-of-charge retro-caravaning-listening-pleasure, check out the clip at the bottom of the page. In this case, ‘retro’ refers to the eighties! 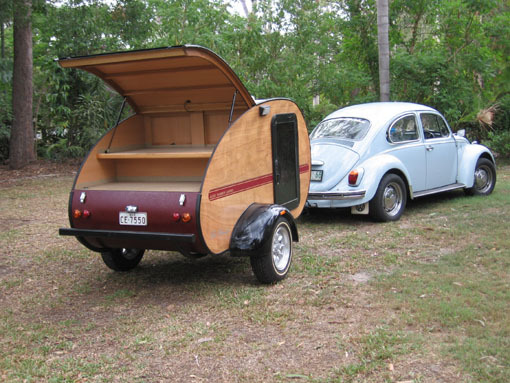 And at the other end of the cost spectrum we have the Aussie Teardrop Camper. Beginning at $12,750, the Teardrop reflects the design aesthetic of 1940s camper trailers but includes modern amenities (DVD players, microwaves and so on). Although it might be a little squashy for family holidays, the Teardrop is a compact and super-stylish alternative to standard caravans (each Teardrop Camper includes a double bed and a kitchenette).